The other day I picked up a new make up item – blush or rogue as some call it. I have not normally worn blush but as I am starting to approach the big 5-0, well let's just say, make-up is appreciated. (OK, maybe that's a stretch). As I thought about what the blush did for my face, it made me think a little deeper upon the light that Christ brings to my soul. I think we all crave sources of “light” in our lives and are drawn to things that make us maybe not only look brighter but feel brighter. In this pursuit, sometimes we look to things that are false and may temporarily provide what seems a source of light, but they don't truly sustain us. Sometimes we look to things that when the washcloth of life comes, just like the blush, they are washed away. syndrome. I believed that when my prince in shining armor came, I would jump up on his white horse and he would whisk me away and all would be right with the world. At least in my world. Well, it didn't happen that way. In fact, I went through one broken relationship after another until I finally realized this dream was not real. No man could save my soul. It was then that I was introduced to Christ, really coming to Him as a last resort. He found me, even in the midst of my darkness, and slowly as I came to know Him more and more, He healed those broken places for me. My life did not become perfect by any stretch of the imagination but for the first time that empty place I always felt and yearned for someone to fill became filled as I spent time with Christ and poured out my prayers upon Him. I came to know a light that worked from the inside out. It was a light that proved itself to not only be real but to sustain itself in my trials, my ups and downs, my doubts and questions. We no longer need to look for sources of light from the outside as He will light us up from the inside. He alone is enough. He alone will sustain. I still put on my blush in the morning and I like the way it brightens up my face but I know that the blush will wash off. I know it's not real. However, the sustainer of our souls lives inside us. 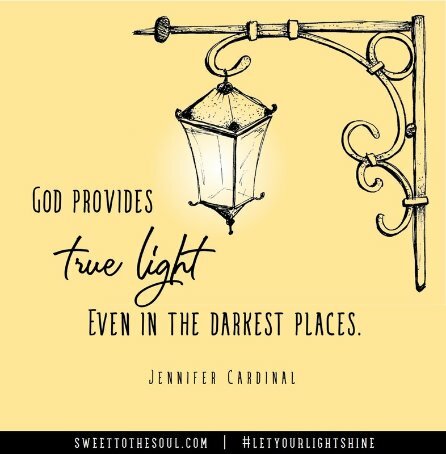 He provides true light even in the darkest of places. We can rely on Him. He is real. He illuminates us from the inside out. 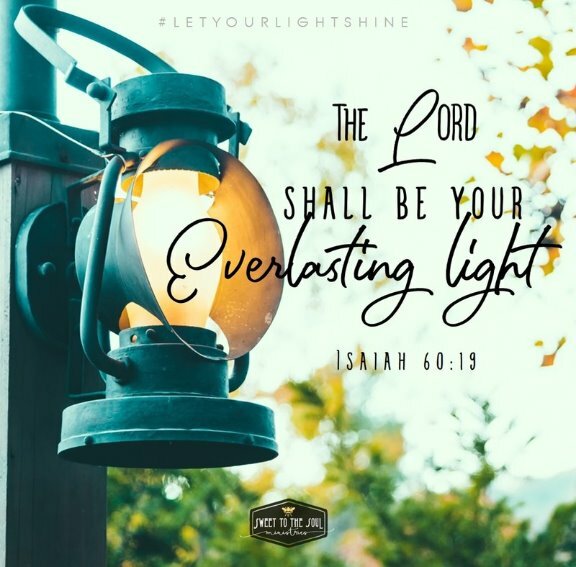 A light to which none can compare whether it be the sun by day or the moon by night or even the promise of a knight is shining armor—God alone is the one true light. 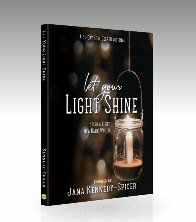 Father God, please forgive us when we look to things of the outside world to bring us light. Father we are broken, we have dark places that are sometimes hard to reveal but we know you see it all. Father help us to bring to you our broken places. Help us know you are our safe place. Help us to trust and know that you love us. We are your children and you desire nothing more than to live inside us and bring us your true light that we may live in your glory. We surrender all this to you Lord. We trust you and we thank you for being our light and leading us to what is true, what is pure, and what will sustain us. In Jesus name we pray all this – Amen.